Léon-Augustin Lhermitte, Haymaking Time (La Fenaison), 1897. Oil on canvas, 29 1/2 x 38 1/4 in. Milwaukee Art Museum, Purchase with funds from Avis Martin Heller in honor of the Fine Arts Society, M2010.68. Photo by John R. Glembin. On October 14, the Milwaukee Art Museum opened the exhibition Impressionism: Masterworks on Paper. The exhibition perfectly sets the scene for looking at a painting recently acquired by the Milwaukee Art Museum, shown at left as it looks mid-conservation. Haymaking Time (La Fenaison) by the French artist Léon Augustin Lhermitte (1844–1925) is one of the most important paintings by an artist who was extremely influential in his day, but is not a household name today. This painting can begin a conversation about how wide-ranging the term “impressionism” can be, and who was part of that celebrated movement, and who was not. Although “impressionism” is a handy description for the 21 artists featured in the Impressionism: Masterworks on Paper–the the first exhibition devoted exclusively to the significance of drawing in these avant-garde movements– the word “impressionism” doesn’t reflect the wide variety of styles on display in the exhibition. 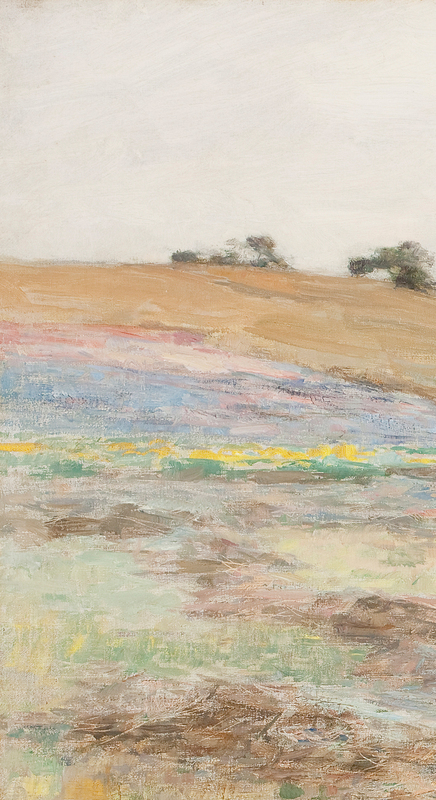 In the Baker/Rowland gallery, you’ll find examples of art movements including Impressionism, but also Neo-Impressionism, Post-Impressionism, Cloisonnism, and Symbolism. You’ll see a wide range of techniques, such as charcoal, conté crayon, pastel, watercolor, gouache, chalk, oil, and monotype. Also, you’ll see a wide array papers–including silks and experimentation on canvas–so it could take a you all day to discover the variety in this exhibition. Seeing all of this experimentation in the late 19th century, it doesn’t seem such a stretch to see this type of “impressionistic” artwork as the progenitor to the experimentation displayed by all manner of modern art of the 20th century. This is what we mean by avant-garde art. This is art that pushed forward art. But back to the focus of this blog post, Lhermitte. Léon-Augustin Lhermitte, Haymaking Time (La Fenaison), 1897. Detail. Oil on canvas, 29 1/2 x 38 1/4 in. Milwaukee Art Museum, Purchase with funds from Avis Martin Heller in honor of the Fine Arts Society, M2010.68. Photo by John R. Glembin. Lhermitte was a draughtsman, printmaker, painter and illustrator. The only son of a village schoolmaster, his drawings skills won him a grant from the state to study art. He studied at the Petite École in Paris where his fellow pupils included Henri Fantin-Latour and Auguste Rodin. Starting in 1864, Lhermitte showed drawings at the Salon (the official art exhibition of the Académie des Beaux-Arts in Paris) and spent his early career as an illustrator. In 1874, he won a third-class medal at the Salon for The Harvest, which was purchased by the state and is now owned by the Musée des Beaux-Arts, in Carcassonne, France. This means, in 1874 Lhermitte was an insider with the art-world insiders. A the same time that Lhermitte is winning medals for his work at the Salon, 1874 was the same year a number of French artists organized the first Impressionist exhibition in protest against the never-changing standards of that French Salon. Clearly, Lhermitte followed the traditional path of a French artist, unlike the Impressionists. He continues to show at the Salon through his long career. In fact, Haymaking Time was Lhermitte’s entry into the French Salon of 1897 during the height of his popularity. Also, how would you describe Lhermitte’s artistic style? Perhaps surprisingly, the brushwork and coloring used in Haymaking Time resembles the paintings of the Impressionists around 1900. As you can see in the detail at right, he is clearly looking at Impressionist artists, but his technique is more conservative and he doesn’t experiment much with subject matter or materials. He’s looking for popular appeal in order to sell paintings, so he’s playing it safe. In 1879, Edgar Degas noted in a sketchbook that he intended to ask Lhermitte to exhibit with the Impressionists, but Lhermitte never participated in any of their shows. So although Lhermitte is close to a number of the Impressionists, he doesn’t identify with them. One important distinction between Lhermitte and the Impressionists is that he did not paint en plein air (in the open air). He continued the tradition of sketching studies outdoors, then composing a thoroughly planned work in the studio. Then, there is the subject matter of the painting: a farmer’s family at work in the field, gathering hay into ricks. Lhermitte used this subject throughout his entire career. In fact, Van Gogh even called Lhermitte “Millet the Second,” after the great French Realist painter Jean-François Millet (French, 1814—1875) who was fond of field scenes. Two of Millet’s most famous paintings are of similar subjects, The Angelus and The Gleaners, both in the Musée d’Orsay in Paris. Rural life was a popular subject matter of the Realists, who portrayed rural life with the dignity and seriousness of historical and religious painting. Of course, one could argue this was a harmonious ideal that did not reflect the true hardships of the people. The Realists may not have been real at all. Although artist interested in Realism used this subject matter, it didn’t mean that more revolutionary Impressionists painters also didn’t explore those subjects. The most notable example is Camille Pissarro, who is featured prominently in Impressionism: Masterworks on Paper. Just to make it even more complex, Lhermitte’s long career meant that he continued to exhibit into the 20th century. He never really changed his style or the subject matter that gave him financial success, and this made him seem like a relic from another era compared to artists such as Gauguin, Van Gogh, and the Fauvists who were really doing revolutionary things. Many of his late paintings were criticized as being sentimental. This Impressionistic painter of the subject matter of Realism, did, however, influence those artists who took up Social Realism. In contrast to the heroic portrayal of the rural life in the 19th century, the Social Realists brought to the forefront the everyday conditions of the working classes and the poor in order to criticize the policies and social expectations that cause them. This peaked in the United States during the Great Depression with photographers such as Dorothea Lange and Walker Evans. Léon-Augustin Lhermitte, Haymaking Time (La Fenaison), 1897. Detail showing restored areas. Oil on canvas, 29 1/2 x 38 1/4 in. Milwaukee Art Museum, Purchase with funds from Avis Martin Heller in honor of the Fine Arts Society, M2010.68. Photo by John R. Glembin. 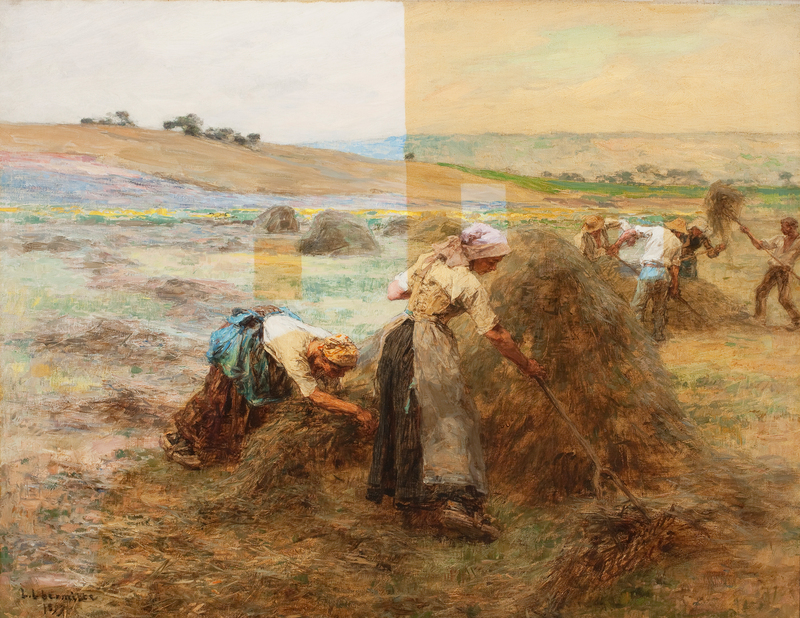 Consequently, although Haymaking Time looks like a straightforward artwork, it gives great insight into the problems of these “isms” and art movements at the turn of the 20th century. After you visit Impressionism: Masterworks on Paper, check out this important—and beautiful—painting in the permanent collection gallery. It hangs in Gallery #11 with other works of Impressionism. NOTE: As a bonus, this recent acquisition allows for a fascinating look at the conservation process, because the painting is on display between cleaning sessions. The original varnish, which is discolored from dirt and age, is removed in order to reveal the bright colors that the artist intended. You can see this above in the areas that appear “yellowed”. This entry was posted in Art, Curatorial and tagged Camille Pissarro, conservation, Edgar Degas, Henry Clay Frick, Impressionism, Impressionism: Masterworks on Paper, Jean-François Mille, Léon Augustin Lhermitte, Post-Impressionism, salon. Bookmark the permalink. I’ve seen two other paintings on this subject painted by Léon Lhermitte, one in the Van Gogh museum in Amsterdam, one in Musée D’Orsay in Paris, both painted earlier than the Milwaukee canvas: both seemed to me much deeper and more dramatic than the later canvas which focuses on the physical side of this arduous occupation.